Philadelphia is the largest city in Pennsylvania and the fifth-most-populous city in the United States. 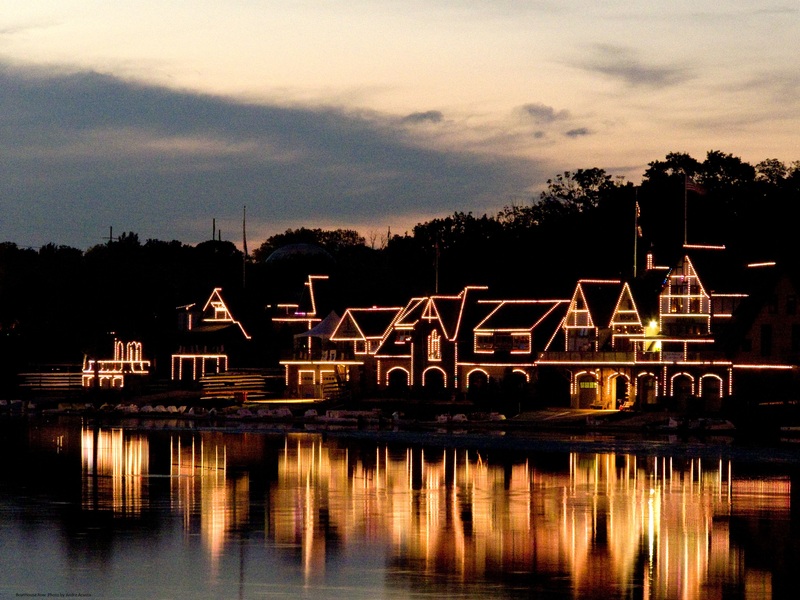 It is located along the Delaware and Schuylkill rivers. The city has a population of 1.5 million. Philadelphia is the economic and cultural center of the Delaware Valley, home to 6 million people and the country's fifth-largest metropolitan area. 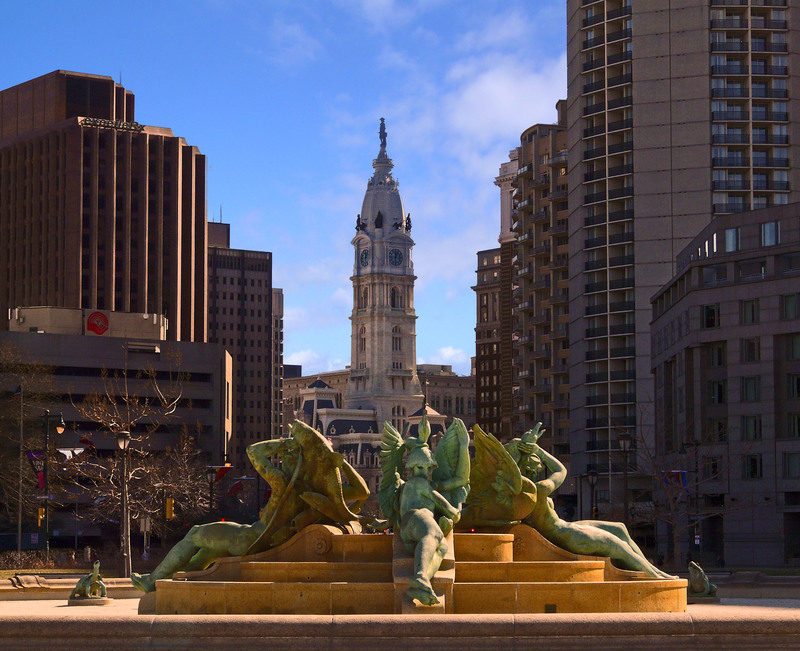 In 1682, William Penn founded the city to serve as capital of Pennsylvania Colony. By the 1750s it was the largest city and busiest port in British America. During the American Revolution, Philadelphia played an instrumental role as a meeting place for the Founding Fathers of the United States, who signed the Declaration of Independence in 1776 and the Constitution in 1787. Philadelphia was one of the nation's capitals during the Revolutionary War, and the city served as the temporary U.S. capital while Washington, D.C., was under construction. During the 19th century, Philadelphia became a major industrial center and railroad hub. Philadelphia has shifted to an information- and service-based economy. Financial activities account for the largest sector of the metro economy, and it is one of the largest health education and research centers in the United States. Philadelphia’s history attracts many tourists. Philadelphia is known for its arts and culture. The cheesesteak and soft pretzel are emblematic of Philadelphia cuisine, which is shaped by the city’s ethnic makeup. The city has more outdoor sculptures and murals than any other American city, and Philadelphia’s Fairmount Park is the largest landscaped urban park in the world. Click here for full-sized map. The conference hotel is located near Rittenhouse Square, which is on the National Register of Historic Places and was included as one of the five parks in William Penn’s 1683 plan for the city. Originally known as Southwest Square, in 1825 it was renamed in honor of noted Philadelphian David Rittenhouse who served as treasurer to the Continental Congress during the Revolutionary War. The square is a popular gathering place bustling with activity. Surrounded by charming shops, restaurants, and boutiques, it is conveniently located near many of Philadelphia’s “must-see” places. 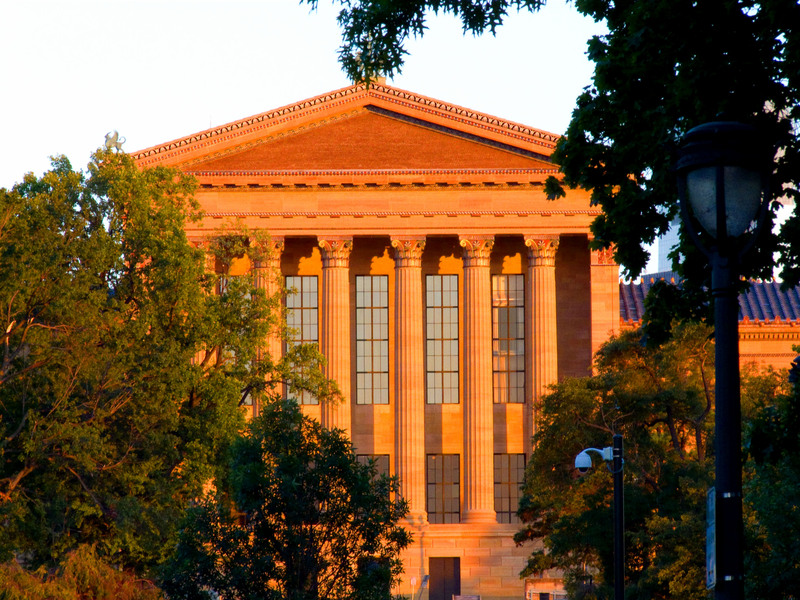 It is a 20 minute walk to the new Barnes Foundation Museum, Franklin Institute Science Museum, the Museum of Natural History, the Rodin Museum, the Philadelphia Art Museum, and many others. 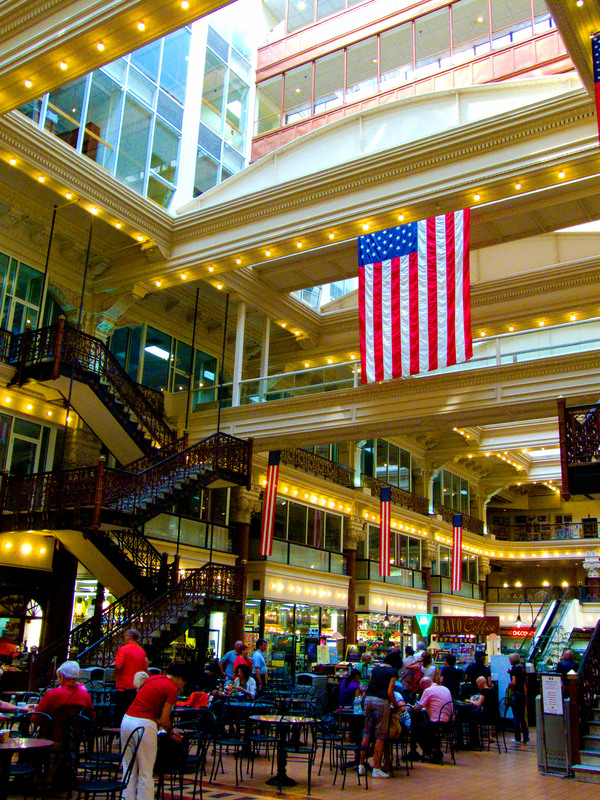 Located about 12 blocks from the Radisson, right behind the Philadelphia Downtown Marriott (1201 Market Street), is the Reading Terminal Market. It occupies the ground floor and basement of the renovated Reading train shed. There are entrances to the market on Filbert Street, 12th Street, and inside the convention center. With over a hundred shops, the market boasts vendors selling meats, fish, groceries, ice cream, flowers, baked goods, crafts, books, clothing, and specialty/ethnic foods. Any visit to the market must include a stop at Bassett’s Ice Cream, a Philadelphia landmark since 1861, conveniently located on the 12th and Filbert Streets intersection next to the hotel. 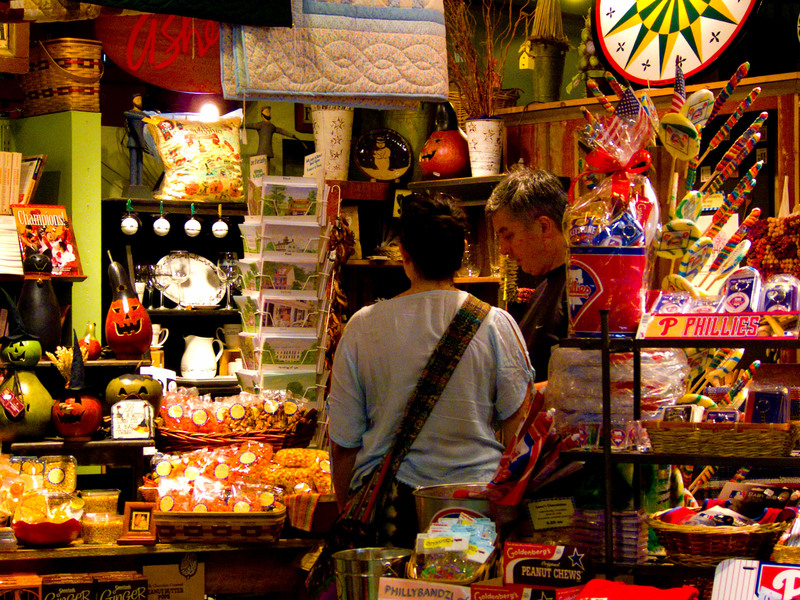 Two blocks south of the Reading Terminal Market you will find the upscale shops along Chestnut Street. The walk down Chestnut Street has shops such as J. Crew, Nine West, Express, Godiva Chocolates, Sephora & Daffy’s, H&M, and many more stylish shops. The Shops at Liberty Place is just down the block from Continental. Once you’ve exhausted the Chestnut Street possibilities, cut down to the intersection of Walnut Street and Broad Street where you will find Shops at the Bellevue. The historic Bellevue building anchors Rittenhouse Row and the Avenue of the Arts where designer shops such as Nicole Miller, Polo/Ralph Lauren, and Williams-Sonoma are located. Teuscher Chocolates is also in this area allowing you to complete your chocolate cravings for this walking tour. This walking tour is a great place to find coffee shops with local flavor and Italian ice cream, Philadelphia style (13th and Sansom Streets), as well as many locally owned/operated bookstores and local-interest stores. Just beyond Reading Terminal Market starting at 11th and Arch Streets is Philadelphia’s Chinatown. Not as large as San Francisco’s or New York’s, Philadelphia’s Chinatown is still a source of local pride and very robust with friendly and helpful merchants. The entrance to Chinatown is marked by a large archway at 11th and Arch Streets. Easy access to its many shops and attractions can be obtained through the entrance to Philadelphia’s Convention Center. If you want to explore the other side of the tracks (literally) and see Philadelphia’s more funky and colorful side, head to South Street for a famous Philadelphia cheesesteak at Jim’s Steaks. South Street is Philadelphia’s “capitol of cool”. With a vibrant night life, South Street is on the cutting edge of fashion, music, and dining. Free Tours By Foot - Guided walks through some of the historical blocks around Independence Mall and other parts of the city. The Constitutional - Download the Constitutional Walking Tour map at this site for a walking tour adventure on your own. Not-So-Much Walking Tour - For those of you who would like to take in the walking sites without so much walking, Hop on/Hop off bus tours are available for a quick riding tour around some of the more notable Philadelphia landmarks. Tickets average about $25 for adults and $10 for children. Horse Drawn Carriage Tours - For those seeking a slower ride through historic Philadelphia and a little more local flavor, not to mention local aroma, horse-drawn carriage rides are available around Independence National Historic Park. A 20 minute private carriage ride is just under $30, enhanced by well-trained carriage drivers entertaining passengers with historical tales, cultural highlights, and stories of the city’s past. 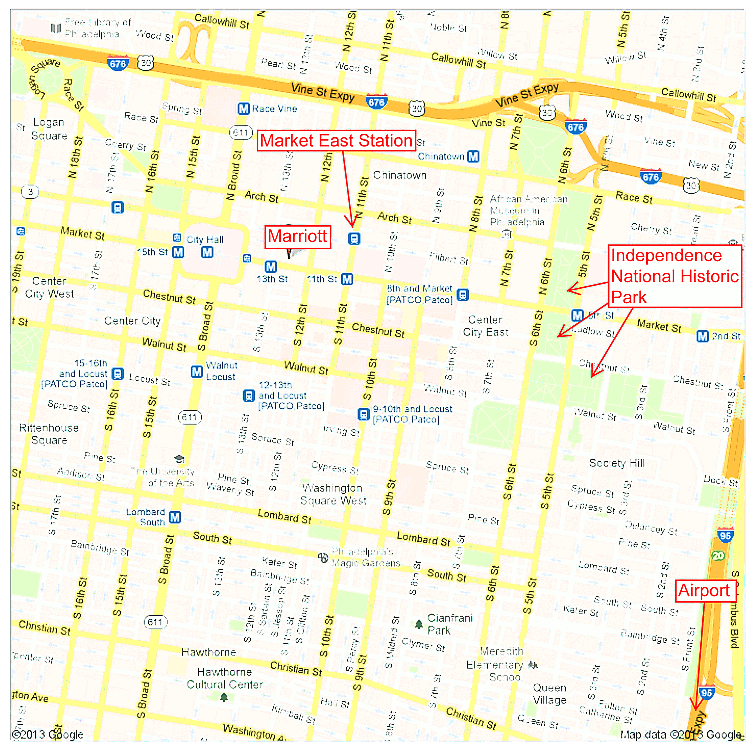 The Independence National Historic Park (INHP) is at the heart of the historic colonial district in Philadelphia and a good place to start any visit to the local Philadelphia historical sites. The Visitor Center is located at Market Street between 6th and 7th Streets, one block from Independence Hall (Chestnut Street). The block in between the Visitor Center and Independence Hall is the Liberty Bell Center. Visitors to The Liberty Bell Center do not need tickets or reservations to see the Liberty Bell. Normal hours are 9:00am to 5:00am daily. Entrance to the Liberty Bell Center is on 6th Street between Market and Chestnut Streets. Between March 1st and December 31st tickets are required to enter Independence Hall. Tickets are free, but are limited, and can be obtained for any available time at the Visitor Center on the day of the visit. The first tour starts at 9:00am. During the busy season tickets are often gone by 1:00pm. The ticket window opens at 8:30am. You should arrive early (before 10:30am) to have the greatest choice of times. You may also reserve tickets in advance for a small fee. Elfreth’s Alley is named after Jeremiah Elfreth, a blacksmith and land speculator, who built many of the alley’s homes in the mid-18th century. The homes were often rented to artisans such as cabinetmakers, silversmiths, pewterers, glass blowers, and wagon builders. Dwellings in the “center of the city” were owned by prosperous merchants leaving the artisan middle class to congregate on the “outskirts” of the city along Elfreth’s Alley which is now considered the nation’s oldest residential street. Try not to miss Bladen’s Court located midway down the street; this “alley within an alley” leads to a charming circular courtyard. Mantua Maker’s Museum is located at house #126. Tickets to the museum can be purchased at house #124. Located at 239 Arch Street between 2nd and 3rd Streets, the Betsy Ross House is an easy walk from INHP. Admission is $5 for adults and $4 for children. Located 2 blocks east of INHP, Franklin Court is the site of Benjamin Franklin’s house. The original house no longer exists; it was razed in 1812. In its place is a 54-foot high steel skeleton “Ghost Structure” in the shape of the original house. The site also contains the US Postal Service Museum, the Franklin Print Shop, and the Franklin Museum which contains many of the original plans for the house as well as other Franklin documents. It is not uncommon to run into one of the many “official” Franklin impersonators in this area. One block east of Independence Hall is the John Todd House. John Todd was a Philadelphia lawyer who succumbed to yellow fever in 1793. The house’s historical significance is due to John Todd’s wife, Dolley. Known as a “fabulous and spirited” hostess, Mrs. Todd’s hostess skills came in handy when her second husband, James Madison, became the fourth president of the United States. Her strength and skill also served her well when she and President Madison evacuated the White House in 1812. Nearby to the Todd House is the Bishop White House. Jacob Duche headed the Anglican Church in the colonies in the early 1770’s. Duche supported the colonists against the British during the rebellion. This did not sit well with the Anglican church officials in Britain who called Duche home and forced him to recant his views. William White ultimately succeeded him and went on to become the first Bishop of the Protestant Episcopal Church of Pennsylvania. He was a beloved figure in Philadelphia for his charitable work which included ministering to those infected with Yellow Fever in the 1790’s while many other men of wealth fled the city. 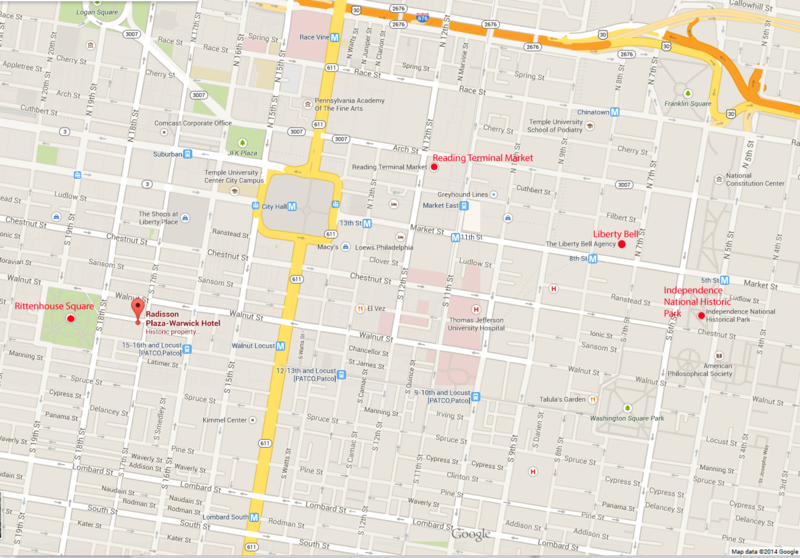 The Graff House is located on the corner 7th and Market Streets one block west and one block north of Independence. In June 1776, the Second Continental Congress assigned Thomas Jefferson, Benjamin Franklin, and John Adams to a committee that was asked to write a declaration which enumerated the causes that led to the severance of ties with Great Britain. It is now well known that the committee assigned Thomas Jefferson the task of writing the document himself. Finding his lodging in the heart of the city uncomfortable, Jefferson moved to the Graff house on the “outskirts” of town where he rented furnished rooms much more to his liking. Jacob Graff, a well known bricklayer, had built the house only a year before. It was in this house, now known as the “Declaration” House, that Jefferson penned the Declaration of Independence. The original structure was torn down in 1883, but extensive photographs of the site enabled the National Park Service to rebuild a faithful recreation of the original building. The exhibit includes a recreation of the two rooms Jefferson rented on the second floor. There are many more historical sites in this section of Philadelphia. Some of the more interesting historic sites are churches and cemeteries that date back to colonial times. The cemeteries are the final resting place for many of the historical colonial figures important to Pennsylvania history and the early history of the nation. 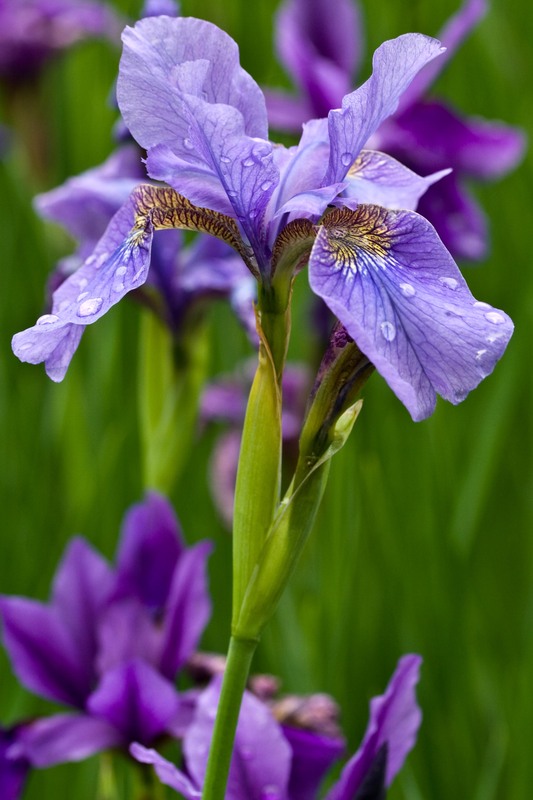 Tours of churches and cemeteries can be arranged through local organizations. Directly behind Independence Hall are Independence Square and Washington Square which date back to original plans for the city laid out by the City’s founder, William Penn. Park benches and walkways make these squares a very pleasant and peaceful rest while taking in the sites. Philadelphia has been at the center of many other historical events since the Colonial and Revolutionary periods. The city played a major role in the Underground Railroad prior to the Civil War. The Johnson House and the William Still Residence are just two examples of Underground Railroad stops that are now a part of the historical register. For those of you planning a little extra time in Philadelphia or a family vacation, here is a list of some other recommended historical landmarks to visit. Click on the link for more information. 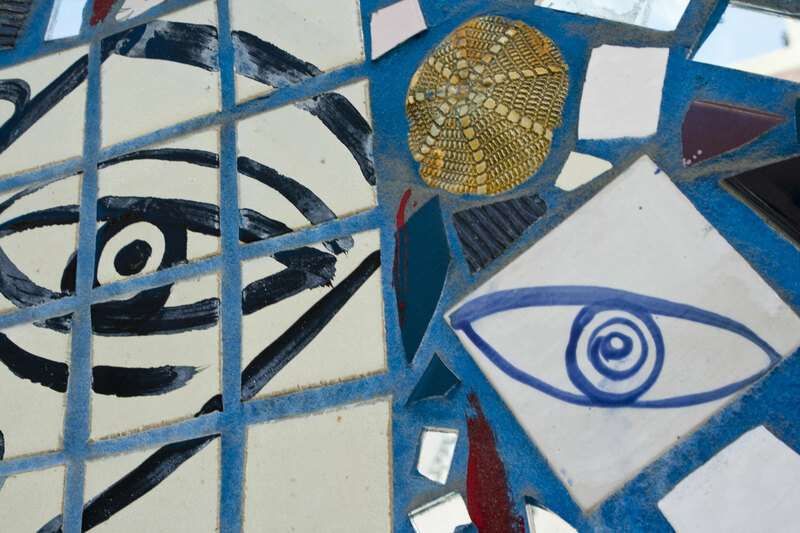 Philadelphia has a very active and diverse art and performance scene. There are many interesting museums, theaters, performance venues, and attractions that would be of interest to families on vacation. A few regional suggestions are mentioned here. These are all within the city or an easy day-trip from the city. Click on the link for more information. Information about parking is available on the hotel services webpage. Last modified August 5, 2014.